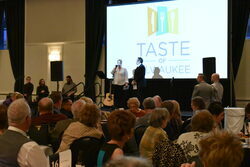 Taste of Milwaukee celebrated its 37th year at the Italian Community Center featuring many of Milwaukee’s finest and famous restaurants. Hosted by Broadscope Disability Services, all of the proceeds went toward helping people with disabilities and their families. 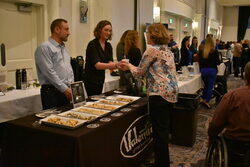 Taste of Milwaukee invited 20 establishments, including restaurants, café’s, food trucks and wineries to showcase their signature items. Some of the restaurants included Saz’s, 9th Slice, the Bavarian Bierhaus, Valentine Café, Lovely and Tasty Walking Tacos, Get Them While Their Hot Tamales and two Bartolotta restaurants – just to name a few. Probably the most well-known was Saz’s. I spoke with Jason Cornelius, the General Manager, and he says that after 43 years they have definitely established themselves here in the community. The restaurant gives back any time it can, including going to benefit events like Taste of Milwaukee and donating to charity. Cornelius says that Saz’s simply wants to support the people who have supported them all of these years. Saz’s brought its signature flatbread with roasted mushrooms, caramelized onions, fig jam, fontina and parmesan cheese with white truffle oil and chives, prepared by Chef Justin Verbanac. The Bartolotta restaurants are also very active in the community. Not only have they attended Taste of Milwaukee in the past, many times a year the Bartolotta restaurants participate in events benefitting people in need and donates to various organizations including the Liver Foundation and the Performing Arts Center. Joey Gerard’s served raw beef, onions and deviled eggs, while the Rumpus Room served their signature deviled eggs with Rumpus candied bacon, a fan favorite and an item that has been on the menu since they opened. Fresh, fast and friendly is what’s happening at 9th Slice Pizza Co. Alycia Pogreba, Store Marketer, explained that every ingredient is fresh and the pizzas are made in-house and quick fired for just over 3 minutes. Not only is it fresh, it can be made healthy. At Taste of Milwaukee, 9th Slice showcased their health-conscious pizza with a cauliflower crust and topped it with their signature artichoke dip. They also had to serve their famous 9th slice – a slice of hot chocolate chip cookie, a dessert everyone walking through the door gets at 9th Slice. 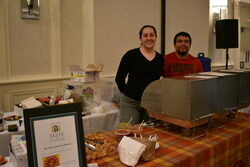 From Italian to Mexican, Taste of Milwaukee had a great variety of food for its guest to sample. Lovely and Tasty Walking Tacos is a local catering company offering Dorito flavored walking tacos. Taste of Milwaukee was Lovely and Tasty Walking Taco’s first charitable event, but Laquana Beverly and her partner say they would enjoy doing another event again like this. 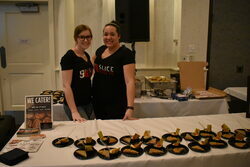 The duo served they’re signature walking tacos and their best seller, the Loaded Nachos. Another Mexican establishment was not far away. Get Them While They’re Hot Tamales, a food cart and catering business, served their signature tamales, either spicy or not, along with nachos and a sliver of churro. Ran by Jann and Pedro, the ma and pa business started in 2010 and has recently launched a website that features fundraising catering – a way for Get Them While They’re Hot Tamales to give back to the community they’ve lived in for over 50 years. Moving toward the drinks, we arrive at Valentine Café and Wine Bar, a fairly newer establishment to the area, celebrating it’s second year. Robb Kashevarof, Founder of the company, and his staff at Valentine Café enjoy giving back to the community so they try to attend as many benefit events as possible. Valentine Café served an assortment of sweet and savory scones including Cranberry Orange, a blueberry Glaze, a Chocolate, Lemon Poppyseed, an Everything scone, as well as a Ham Cheddar and Chive. 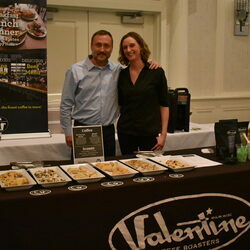 Beside the scone, they served their signature Valentine coffee, roasted here in Milwaukee. Finally, what is an event in Milwaukee without beer? German beer at that! The Bavarian Bierhaus attended Taste of Milwaukee to not only help and support people in need, but to also showcase their specialty beer. “The Bavarian Bierhaus has been 90 years in the making,” says Matt Prostek, Brand Ambassador. Full steam ahead, in the last three months, the bierhaus has revamped its menu and beer selection. The beer selection offered by the Bavarian Bierhaus at Taste of Milwaukee included a Pilsner, a Dunkel, a Hefeweizen and a house choice for the evening which was the Night Marauder. Other than coffee at Valentine and beer at the Bavarian, other places offered wine and typically was paired with the dish. These places included Fleming’s, Greige, and Lo Duca Wines. All the while, Soulboxer Cocktail Co. poured their signature brandy and bourbon old fashions. Besides the restaurants mentioned, Café Benelux, The Gouda Girls, Rollin’ Dough Specialty Cookies, the Foxfire Food Truck, Thunder By Grille, Oberweis Dairy and Famous Dave’s also participated in the 37th annual Taste of Milwaukee. SCJohnson was a major sponsor for Taste of Milwaukee; this event could not have taken place without their support along with the support of others, including Capital Trust Group, Infinity, and Miller Coors. The 37th Annual Taste of Milwaukee offered a taste and a sip of some of Milwaukee’s finest and most deliciously versatile restaurants. Thank you Broadscope for hosting the event and thank you to the public and your interest in food and giving back to the community you live in.